Established at the midpoint of our extensive 6×24 galvanised wire rope range, this example offers a diameter of 14mm and can be used for a plethora of appealing purposes, catering in particular to uses which take advantage of its innate flexibility. 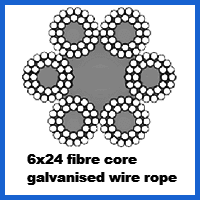 Read on for more on the 14mm 6×24 Galvanised Wire Rope. In contrast with the traditional wire rope products we stock, this galvanised rope is equipped with a core made from fibre. This lets it flex more easily, especially thanks to the fibre cores that sit within each of the 6 exterior bundles of steel wires. The two materials used here lend their positive traits to the rope, letting it bend and twist more easily for load-lashing purposes while the galvanisation prevents corrosion from forming on the surface. Wherever rain, sea spray and general moisture droplets are present in the air, this rope will remain unblemished. Its flexibility makes it well suited to forestry tasks, as well as maritime uses. Since this wire rope is relatively specialised, you might want to consider the advantages offered by some of its stable mates. Our full line up of stainless steel rope might catch your eye, both for the variety it offers and because this material is innately attractive. Plastic coated rope can also be ordered from us, allowing for fewer issues with abrasions and a longer lifespan for your wire rope as a result. Reach out to a Rope Services Direct salesperson by emailing us or calling our hotline on 01384 78004 during office hours. 14mm 6x24 Galvanised Wire Rope Overall rating: 5 out of 5 based on 6 reviews.